Babette Beatty (then Babette March) had already been on the cover of Elle before launching the Sports Illustrated swimsuit issue. (CNN) -- Babette Beatty laughs when asked whether she's seen the cover of this year's Sports Illustrated swimsuit issue. "You have to understand, where I live, we don't get stuff," she said with a chuckle recently. Beatty, born in Germany and raised in Brazil and Canada, now lives in the rural hamlet of Halfway, Oregon, near the Snake River. You would think that seeing the next iconic cover would appeal to Beatty. 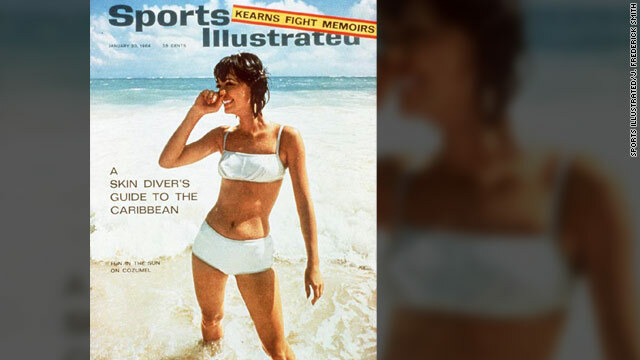 In 1964, on that very first swimsuit cover, Beatty was the star of the show. It wasn't a big deal to her then. "It was just another job," she said. "I never expected it to be big. It just didn't even enter my mind. It was really no big deal for me. I was just working, trying to survive in New York." Beatty was doing more than just surviving. She had been featured in the Paris collections and on the cover of Elle and other fashion magazines. She was one of the top-paid models in the world. Beatty, whose last name was March then, said she looked at the swimsuit shoot as a 10-day expenses-paid vacation to Mexico. The pay wasn't memorable. Beatty thinks it was about $100 a day. She basically went for the trip -- which was wild. Beatty and another German model stayed with the crew in Cozumel, which in the early 1960s was relatively undeveloped. It was home to some fishermen, but in '61, famous ocean explorer Jacques Cousteau declared it one of the best diving spots in the world, and it gradually became more of a tourist destination. Beatty remembers staying in what could be described as a less-than-five-star hotel, flying to shoots in the morning and then partying late with members of the Mexican air force. The former cover model is now an artist and lives in a small Oregon town of 350 people. She described photographer Fred Smith, whom she had worked with before, and the editors as "great." She never really cared whether she got the cover. Through the lens of 2011, it's an innocent cover. Beatty stands in the clear water in a white bikini, as if she's emerging from a dip in the surf. Kind of "wholesome"-looking, Beatty says now. She had no idea what it would lead to for the magazine. Back then, it wasn't even called the swimsuit issue. It was just five pages of a 17-page spread on diving and popular winter resorts, mostly travel stories. Beatty didn't even get her name on the front. Over the years, the SI swimsuit cover reveal has become one of the biggest moments of the year for the magazine, which is owned by CNN's parent company, Time Warner. The issue sells more than a million copies, and according to the Wall Street Journal, about 10 percent of the magazine's revenue comes from that one issue. The issue boosts business for the companies that make the swimsuits and jewelry featured inside. And these days, the cover model gets a huge boost to her career. It wasn't like that in 1964. Sports Illustrated never told Beatty that she was on the cover. "I found out through my agent," she said. In fact, she didn't even have her own copy of the famous issue until just a few years ago, when a man sent her a few copies to autograph. She called him and said she'd sign it if he let her keep one. She still gets lots of mail from across the country -- all from guys, she says -- asking for her autograph. The continuing interest intrigues her. Beatty, who turns 70 this year, is an artist now. After her retirement in 1976, she tried several things, including being a chef. In 1992, she and her husband took a trip west, fell for Halfway and moved into an abandoned church. Beatty runs an art gallery (she paints) and hikes every day, even through the snow. She loves living in Halfway with 349 other people. It's gorgeous, she says. Kind of like the woman on the cover of the January 20, 1964, issue of Sports Illustrated, a photo that launched an institution.